Saturday, February 13th, 2016, saw over 120 Early Years professionals from across the UK and Ireland come together at City College, Southampton to participate in an inspiring event, the first ever UK National Men in Early Years conference. Rewind a year and you witness the SAMEY meeting at which someone proposed a conference as a good idea, enthusiastically endorsed by everyone present. The challenges were not insignificant – no money, no venue, no speakers, no staff, no idea whether anyone would attend, oh, and no previous experience of organising such an event! Other than this we were extremely confident in our abilities – we had optimism on our side. Looking back now, it is amazing that the conference happened, that delegates supported us and that presenters and exhibitors so graciously offered their services. Firstly, City College provided their excellent facilities to us for the day, comprising a 200 seater theatre, an atrium with 4 floors with fully equipped break-out areas in which to host seminars. The students were volunteered to video and photograph the conference. There was a recording studios in which we would be able to record podcasts. How did we put the programme together? I’m not entirely sure. We took to social media and used our contacts in the press to promote the event (for which we had sold no tickets and had no speakers) and people got in touch – some of the top experts in the country volunteered their time to support the day by leading a seminar. What became clear was that there is support across the country for our activities. We generated a lot of interest. My email inbox was filling up with enquiries and offers of help, which arrived daily. The trickle of enquiries turned into a flood and as the conference day approached we were able to choose topics for seminars from the offers we had. The final programme comprised an opening session, followed by 2 groups of 4 seminars to choose from and a plenary session where presenters from the workshops formed a panel answering questions from the audience. The first session opened with a video message of support for the conference from Sam Gyimah, Minister for Childcare and Education. 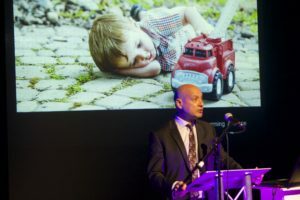 Neil Leitch, CEO of the UK Preschool Learning Alliance, then gave an impassioned and personal talk in which he reminded us of the vital importance of early years and made the case for a balanced gender workforce to better meet the needs of all children. David Wright followed Neil with the challenge of whether we actually need men in early years or not. Lunch was deliberately scheduled with sufficient time for networking, a chance to record podcasts and opportunity to tour the exhibition area. We still await a response!